At Long Last! The Book. A simple, natural therapy device. This heart-felt combination of funny pictures and funny words. A quaint colloquial semantic reference. A little-red Aussie book. A killer-dose of Australiana. Just the good-oil. The right stuff. A dinky-di item. It's the cat's whiskers, the duck's nuts, the bee's knees, and the ants pants. It'll make you smile! 204 full colour pages, bound in a hard cover with dust jacket, and soft case. 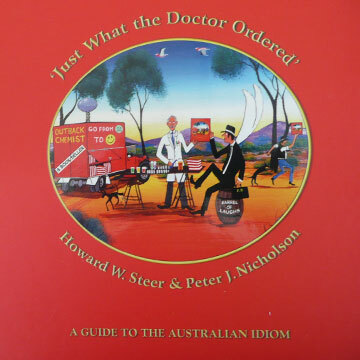 Over 1,000 colourful sayings and phrases of the Australian idiom.169 paintings of outback life, and situations by Howard William Steer which illustrate the essence and unique character of Australians. Books are $65 signed plus $14 postage. There are a limited number of books which will include a painting for $100 plus postage.